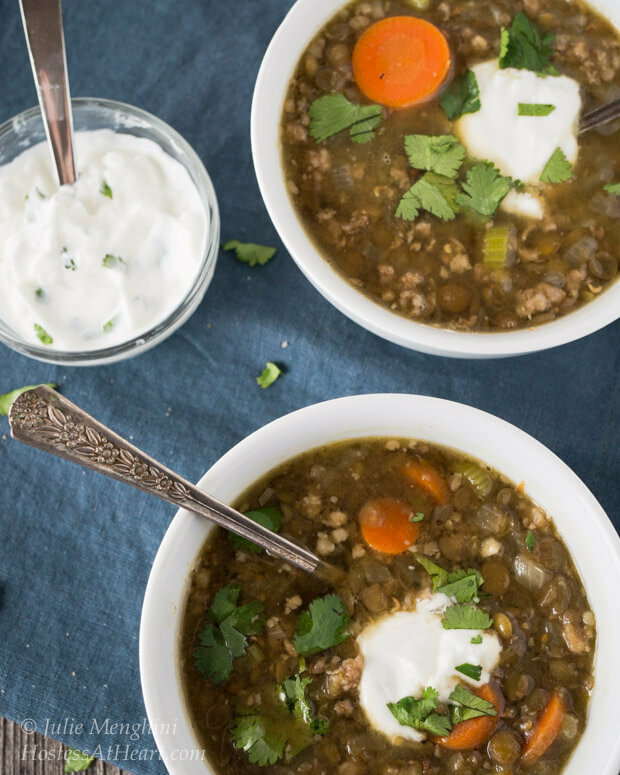 This Savory Lentil Sausage Soup recipe is a delicious high protein soup that takes less than an hour to make but tastes like it took all day. Did you know that there is an official “Soup” month? Yep, it’s January. I don’t know why this should surprise me because we have a month for everything else. I can definitely get into this one though and I am sure I know why they (whoever “they” are) choose January. It’s just too cold for humankind right now, and soup is a great way to eat healthily and still feel full and satisfied after all of those lovely holiday cookies. All of this is the case with my Lentil Sausage Soup! I tried Lentils for the first time last year when I made Crockpot Green Lentil Curry. I don’t know why it was such a momentous thing, I love almost anything when it comes to legumes. There are different kinds of lentils, and they are often used as an alternative to meat because they are packed with protein. For more information consult A Comprehensive Guide to Lentils. You could definitely make this soup without the sausage for a vegetarian or vegan option. There are a couple of steps that I took that are optional. I roasted and ground my own spices. You can use pre-ground. I used an immersion blender to lightly blend the lentils before combining the vegetables and spices. It thickens the soup. You can do this or skip it. See the spoon picture. 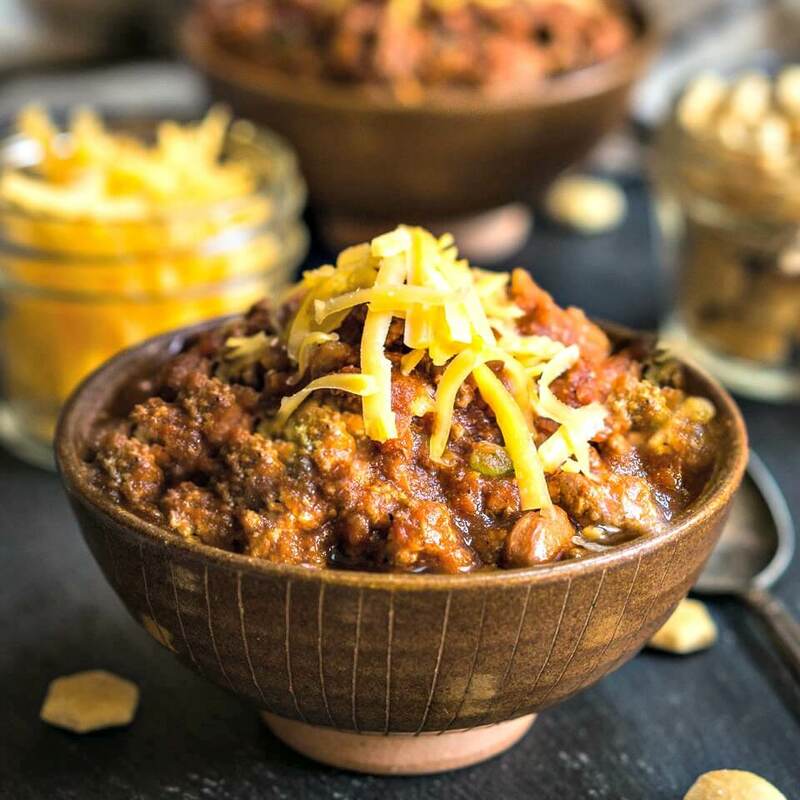 You can use a spicier sausage or use crushed red pepper to kick it up a notch. Tip, you can drain ground meat in a doubled layer of coffee filters sat in a bowl. Then just pick up the edges and dump the meat into the pot. 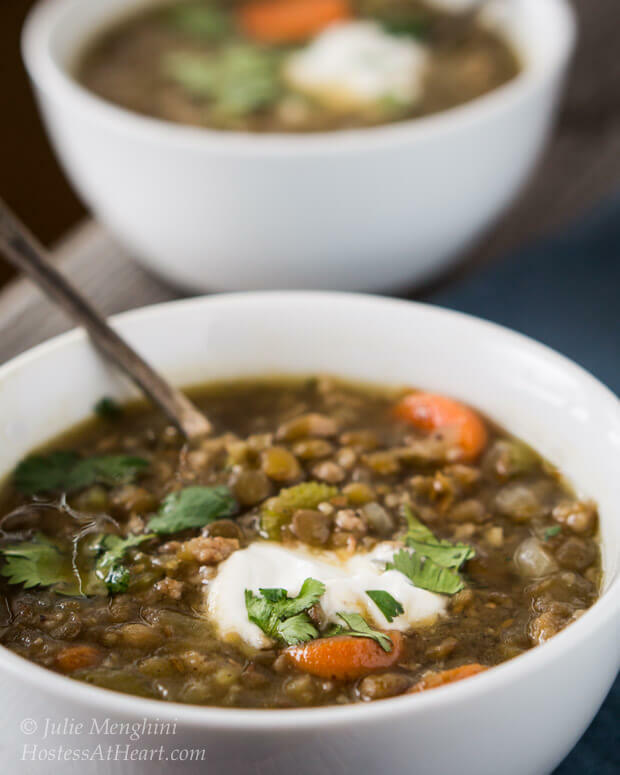 This Lentil Sausage Soup recipe is a delicious high protein soup that takes less than an hour to make but tastes like it took all day. 6 to 8 cups of stock vegetable, turkey, chicken. Rinse lentils in a fine mesh strainer and drain. Brown sausage in a skillet drizzled with olive or canola oil. Remove sausage to a **paper towel to drain, but leave drippings in the pan. Saute lentils in the sausage drippings for a couple of minutes. Remove them to a 6-quart saucepan. Combine lentils with 6 cups of stock and add bay leaf. Bring to a boil for 5 minutes. Cover and allow reduce to a simmer for 40 minutes. While lentils cook, In the skillet that sausage cooked in, add 1 or 2 teaspoons of olive or canola oil if no drippings remain. Add Carrots, celery, and onion. Salt and pepper. Saute until they begin to soften. In a small pan, roast fennel, cumin, and coriander seed until fragrant. Grind in a spice or coffee grinder. Add spices, crushed red pepper, if using, and garlic to sauteed vegetables. Cook for another minute. Using an immersion blender, blend lentils lightly. You still want whole lentils visible. Blending thickens the soup. Combine sausage and vegetables with lentils. Cover with additional stock to get the desired thickness. Salt and pepper to taste. Heat through. Remove bay leaf. Serve with chopped cilantro and a dollop of yogurt and other garnishes as desired. Ground spices can be used instead of roasting and grinding your own seeds. *A coffee filter works great to drain ground meat. This looks so good! I love the spices in it. Also, that tip about draining your meat in a coffee filter is great. Thank you for sharing it and the yummy soup. Pinning this! Thank you Shari! Thought about you this week when I was formulating a new recipe. I failed. Enjoy your weekend! This is just stunning Julie!! What a hearty and delicious soup.. so healthy too!! LOVE it..Pinning! Thank you so much! The more I use lentils, the more I just love them….and Saucy Saturdays! 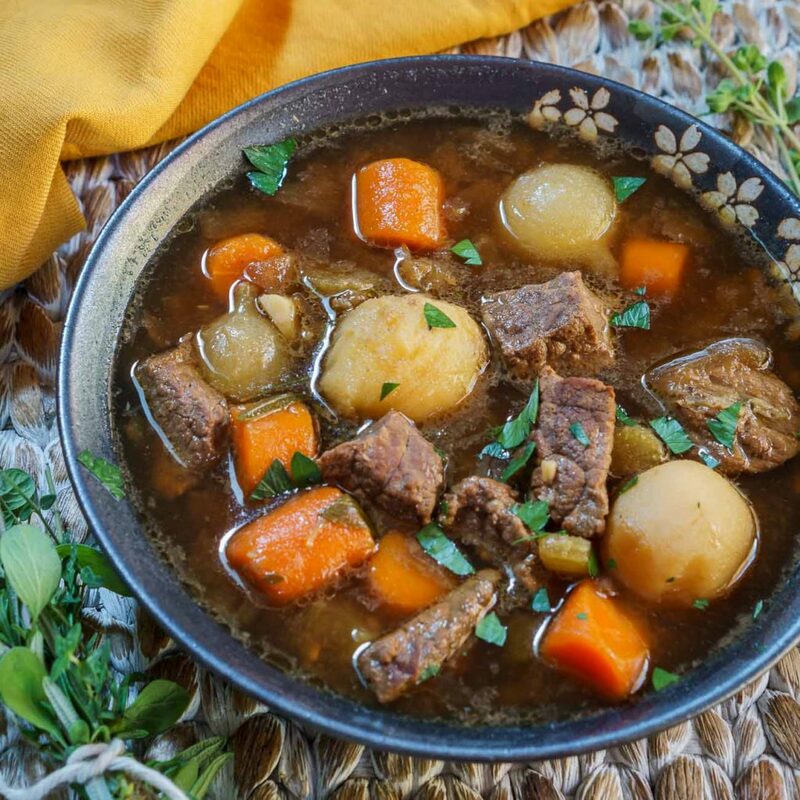 What a hearty, protein packed soup! I will have it without the sausage, of course! Thank you! It would be perfectly delicious without the sausage. Have a wonderful day! Thank you Sarah! I hope you will let me know how it comes out. I really enjoyed it. Thank you Quinn! This was a delicious soup and did a good job of warming my bones. Thank you for the nice comments on my photos, always working on learning more. We are in a cold snap right now and I don’t intend on going anywhere if I don’t have too. Have a wonderful week! I need some of your soup right now. The wind is hollowing and it is getting very cold. Sorry Quinn, I think we sent that weather but not all of it. Minus 7 right now and the sun isn’t down. Not doing a very good job either! This soup would warm your bones! Throw it in the crock pot. Your Lentil Sausage Soup sounds great, Julie! 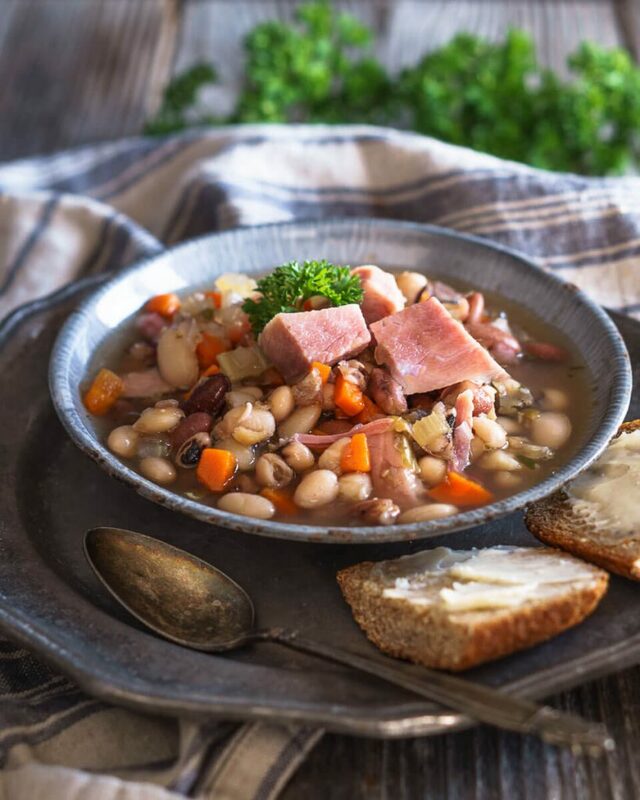 I love lentil soup and like to make it during the winter months, but I’ve never added sausage to it–sounds like a great idea! Thank you Nancy! 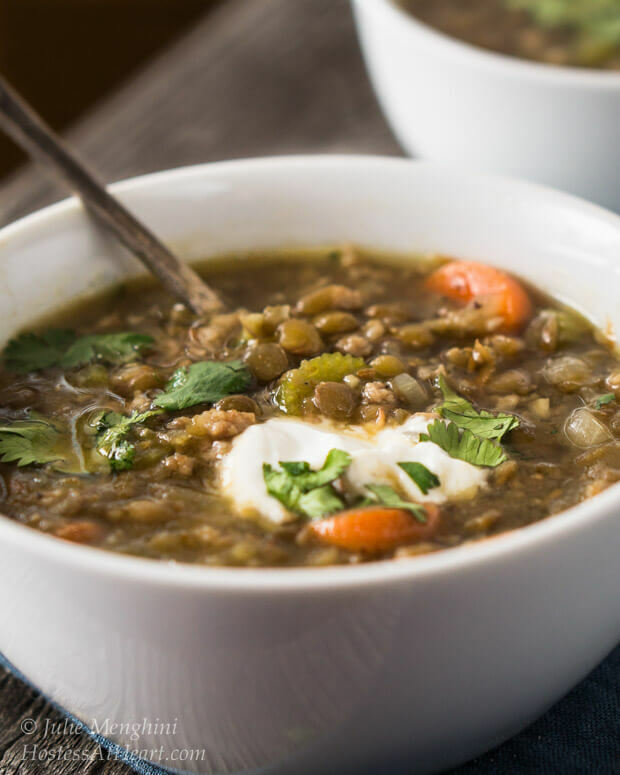 I really enjoyed this soup and even though it took forever to try lentils, I’m very glad that I have. I hope you will try them Cynthia! They are delicious and I think take on the flavor of the dish that you are making. Thank you and I hope you are enjoying your weekend! Thank you Jhuls so much, I appreciate your kind words and help hosting these FF party goers! You are so right about January being soup month! 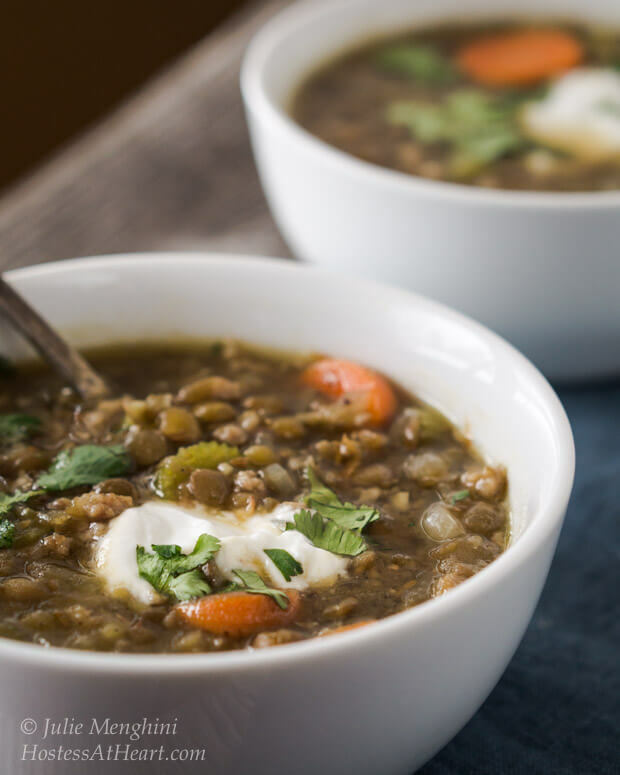 This year, we have barely experienced winter until it suddenly showed up in the last week of Dec 😀 This lentil soup looks perfect to cozy up with right now! Thank you! Winter has definitely hit us, and this soup is helping warm those bones. Looks delicious Julie and I’m all about the soups right now. It’s just so comforting this time of year with the cold weather and after all the indulging during the holidays. Pinned! Thank you Lily! I am on the same page as you. Comfort food without being so heavy. Lovely Julie, can’t ever get enough soups in me these days (although we’re expecting 60deg on Sunday again), the weather has been like a yo-yo! Back to the soup, I don’t think I’d leave out the sausage, to me that would definitely give it additional flavor, just a nice, comforting and satisfying soup all around. Going to see the girls this weekend in NYC, I’ve made minestrone soup, lasagne and banana choc chip bread for care packages :). I hope things are not too bad weather wise where you are? Enjoy the weekend, and Happy Fiesta Friday to you! Thank you Loretta! Have a wonderful weekend with your girls, they are lucky their mama loves to cook. What a delicious care package! We have an actual -4 today with a -20 windchill. Very uncomfortable, but it does get my comfort brain working. Thank you so much James! I promise that it tastes even better than it looks! Happy Friday! I agree! Happy FF to you too! What is the weather doing across the pond? Well this morning it’s rainy.. Not too cold about 6/7 perhaps? Great day to cook Mr Fitz! I don’t know what Korva sausages are! I’ll have to hold out and wait for your post! They are a new one on me too! No doubt you will hit it out of the park! Thank you Chitra! It does warm the bones and fills the tummy! I love lentils too, and, like you, didn’t grow up eating them much at all. Thank goodness we live and learn 😉 Beautiful pics! I agree Susan! I wish I had known about them years ago when you are always looking for new dishes. One of my favorite soups – I use low-fat turkey kielbasa/sausage and leave it out when I am feeding vegetarians. Actually, it is Ina’s recipe I found in a magazine some time ago. That does sound wonderful too. They are so versatile. That or I think that maybe I am not that open minded when using other kinds of beans? Thank you Judi! Have a great weekend! Thanks Debbie! I can believe that because this only the second time I’ve tried them. I really like them and wish that I’d tried them years ago. They give me new sides and soup ideas. Ha! You will wonder why you waited! Thank you Lynz! It was so good that I ate it almost everyday with a slice of that bread. My appetite didn’t get the memo that I was supposed to start watching my diet a little bit this month. Thank you! I’ve been eating this soup all week, and still had some for the freezer. I’ve been serving it with that bread and it’s a yummy combo. Thank you Dear Freda! Happy New Year to you too! Thank you Anna! It is delish! This sounds amazing Julie! 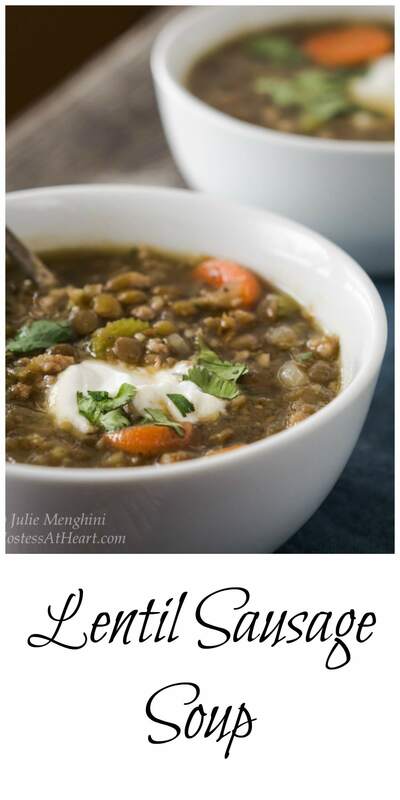 I love Lentil soup and it’s even better with sausage in it! 😀 I love green lentils over the other lentils too! We’re expecting some snow soon, so this would be perfect! Thank you Dini! I was just thinking of you because I was contemplating Sous Vide some fish. How is your experimenting going? Well Cheryl we are sure in the know now right? Heading over to see your work of art! I know you are warm lucky girl! I know! I think he was glad to get back to Miami after removing snow here for two days. This soup looks very cozy and tasty! I want to use more lentils in my cooking, and this looks like a great way to do it. Also, I like your tip for draining meat using coffee filters! Thanks! Thank you Jenny! I love them and want to cook more with them too! Have a wonderful day! Yum! Happy New Year Julie! Thank you Johanne! Happy New Year to you too!